LISBON, PORTUGAL – It is still warm here in Lisbon. Like summer. 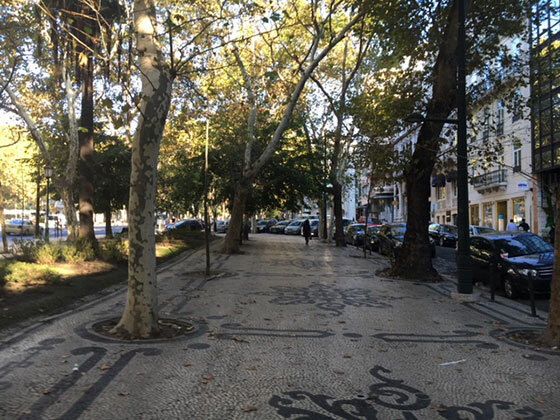 We’re staying at a hotel on the Avenida da Liberdade, with large plane trees shading the wide sidewalks and grand old buildings lining the streets. Bitcoin went over $6,000 on Sunday and then fell on Monday. This morning, it is at $5,752. We all know politicians get a head start when it comes to investing. Most recently, Wisconsin Senator Frank Lasee reportedly bought between $5,000 and $50,000 of a Canadian pot stock. He knows that Canadian marijuana companies give investors an upper hand U.S. companies can’t touch. If you want to follow the smart money. If you want to get in early on the biggest marijuana boom we’ve ever seen, then watch this video right now. “We were urging everyone to learn about bitcoin. This is the biggest thing to happen in the money world since gold was introduced. Our in-house enthusiast knows a bubble when he sees one. “A lot of people are going to lose money in this market. “I still believe in cryptocurrencies. But now everyone wants to get into cryptos. And a lot of these deals are pure rip-offs. Most of these ICOs [initial coin offerings, ways crypto ventures raise capital] have no hope of succeeding. This is like the dot-com craze at the end of the 1990s. He knows one when he sees one. He served 22 months in prison after pleading guilty to securities fraud and money laundering. Easy money, like politics, always attracts scoundrels. And the market for crypto assets is pulling in hustlers… robo traders… and thrill seekers. From their point of view, the words “crypto” or “blockchain” are like the keys to a rich man’s liquor cabinet. And from an investor’s point of view, it’s like betting on who’s the dumbest member of Congress. You have plenty of candidates to choose from… and not much hard evidence to go on. Nearly $1 billion went into ICOs last month. So far this month, according to the Financial Times, 201 ICOs have raised over $3 billion. Republicans and Democrats unanimously passed the AV-Start Act, which paves the way for carmakers to roll out an unusual piece of automotive technology. Within the next 2 years, we could see 10 million of these cars on the roads — a 49,000% increase from today. When you buy a stock, you take a risk: It might go down. The company might even go bankrupt. But you are buying something real – a piece of a business. You can study it all you want. Then you take your chances along with other shareholders. When you buy real estate, too, there is risk involved: Property is subject to wind… and in some places… waves… or fire. Or termites. Or squatters (a problem now on our ranch in Argentina). Or confiscation. Almost everything you invest in has some tangible presence… something real behind the price. Even a gold mine, as Mark Twain remarked, is a hole in the ground. With a liar standing on top of it! But when you buy a new crypto asset (not all of them are currencies), what exactly are you buying? Teeka’s best picks have soared 1,241%, 2,050% and even 14,354% in as little as six months. He’s found a new pick, which he calls “the next big thing in cryptocurrencies,” and is giving away its name during an emergency briefing on November 2nd. Click here for all the details. Its boosters believe it is better money than greenbacks or euro. And maybe it is. Over the last eight years, bitcoin has been tested… challenged… and attacked. But how many of these new crypto ventures will survive? And what will you have when they don’t? No rusting hull of a ship on the rocks. No broken-down farm with weeds growing around the tractor… no souvenir bond certificates to hang on your wall… no baseball cards… no used chewing gum or discarded engine oil. You get… well… maybe nothing at all. On the other hand, bitcoin could go to $1 million, for all we know. And maybe these Johnny-come-lately cryptos will be hugely profitable. But don’t put money into cryptocurrencies unless you either: (a) know what you’re getting into or (b) are willing to say goodbye to it. As Bill mentioned, the world’s most valuable cryptocurrency has been setting all-time highs. But it’s not just bitcoin that is breaking records. 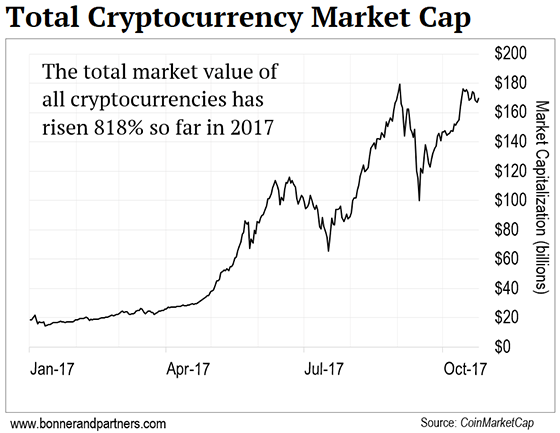 Today’s chart looks at the total market value of all outstanding cryptocurrencies – the total cryptocurrency market cap. As you can see, the value of all cryptocurrencies started the year at $18 billion. Today, it stands at $170 billion – an 818% gain. P.S. The cryptocurrency market has taken off in 2017. And my colleague and cryptocurrency expert Teeka Tiwari reckons 2018 will see even bigger gains. If you don’t know Teeka, he’s the analyst who recommended a small cryptocurrency back in February before it shot up 21,000%. On Thursday, November 2, Teeka is hosting a free training webinar for crypto newcomers. He’ll show you how he spots fast-moving cryptos before they take off… and how you can start trading cryptos immediately. Reserve your spot by clicking right here. Bill has often written that much of “flyover America” is being left out of the economic recovery. Billionaire and hedge fund manager Ray Dalio agrees, and he has a message for the Fed: Pay attention to America’s second economy. As stocks continue to climb, hedge funds are reaping the rewards. Q3 marks the fifth straight quarter where hedge funds saw record cash inflows. States like Illinois are in the midst of a full-blown pension crisis… and it’s only getting worse. Crisis Investing editor Nick Giambruno shows the one unconventional step the government might take to avert catastrophe. I’m trying to understand your view on how the Fed’s “free money” policies have led to the near-zero percent interest rate environment. Of course, it is not just the Fed, but Japan and the EC, as well. The idea is that the world is awash with “free money” which competes with legitimate loans usually earmarked only for vetted and responsible business ventures. This easy money has led to asset bubbles, and other bubbles such as the oil fracking boom, student loans, and auto financing, etc. Trying to connect the dots, how did the Fed’s money printing in the form of Treasury notes affect the real economy? Who bought the QE? Was it the big banks, so filled to the gills with free money that they lent it out at lower and lower interest rates to less-than-deserving ventures? Or did foreign governments buy our debt? If so, then how did this trickle down to the real economy, both global and domestic? Do you believe interest rates are correlated with inflation that is, inversely correlated with deflation? Do you believe they are at all related, causally or otherwise? By the way, I’ve read your books, except your latest, Hormegeddon. None of the public library systems in my area have it on their shelves yet. Looking forward to it. As with candidate position statements, the reason why they take the position is more important than what it is. Maybe you edited the clarification out. I didn’t really notice a difference from the previous format, so specifics would have helped me determine whether or not I agreed. Anyway, the only thing I did notice, and found less enjoyable, was that the link to provide feedback was either missing or hidden. Obviously, I was able to work around that obstacle. I enjoy the Diary. Editor’s Note: Readers can always drop Bill a note and contribute to the Mailbag by simply replying to these Diary emails. Also, you can always reach our team by writing to [email protected]. Cryptocurrencies are some of the hottest assets right now. Bitcoin has shot up 1,200% in two years. Other smaller cryptos have shot up as much as 20,000% in just over six months. If you’ve ever wanted to invest in cryptocurrencies, but don’t know where to start, we recommend you keep reading. 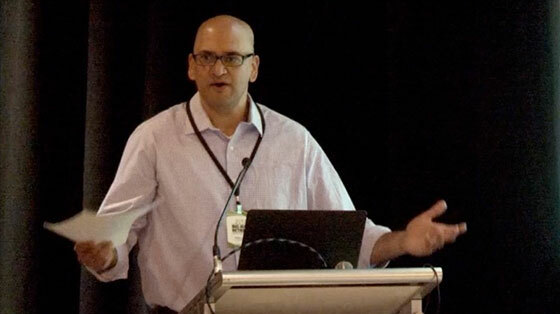 Cryptocurrency expert Teeka Tiwari is hosting a free training session on Thursday, November 2. Teeka will show you how he spots only the best crypto plays (while avoiding the worthless ones) during this free event. Sign up with one click right here.